HOW CAN YOU TELL A MAN’S RING FROM A LADY’S RING? HOW CAN YOU TELL IF A RING IS A MAN'S RING OR A LADY'S RING? Is there a way to tell the Difference? Let’s get one thing clear… Anybody can Wear any Ring (Man or Woman) that there is on the Market. But, it is True that some Rings do Look Better on one Gender Versus the other. Diamond Engagement Rings are a Great Example of this. Women wear Engagement Rings Wonderfully… Men, not so much. Engagement Rings are Primarily Women’s Territory. The Diamond sits Proudly up off the Band. The Mounting is Full of Diamonds and Channels and Lovely Curves and looks like a Beautiful Work of Art. Engagement Rings are Too Flashy and Stunning for Men to Wear… Plus, they are Wayyyyy Tooo Sparkly! It’s just a Visual Thing. Granted, Every Single Ring is Different and these are just my Opinion, but generally, for the Most Part, they are True. Take a look at some Examples showing the Difference in Appearance between Men’s Rings and Lady’s Rings. 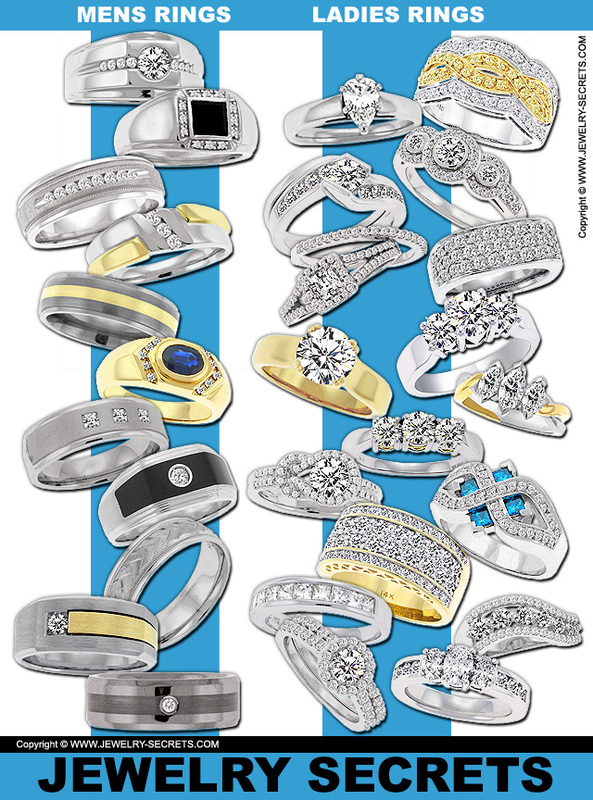 Some Rings could be Universal, Coed, and Worn by Anyone. Rings like: Wedding Bands, Gemstone Rings, Pinky Rings. Men will normally just stick to a more Masculine Ring. Women on the other hand are More Versatile. Women will Wear what ever they like. I’ve seen a lot of Women Wear Men’s Rings that are Heavy, Wide and Thick. Simple Pieces do tend to look More Manly. Most Women can pull this off with No Problem though. After all, they’ve been Wearing Guy’s Class Rings and College Rings for Decades. If you have to Ask, then it’s probably NOT the Right Ring for you. You have to Feel Comfortable with your Jewelry. You Don’t Want to Question your Sexuality. If it’s a Man’s Ring… You’ll know it! That’s usually a Dead Giveaway. Ladies Ring Sizes are normally a 6 or 6 1/2. Mens are normally a Default Size 10. And if that doesn’t Help you, bring a Friend so you can get another Opinion!